Soft Wrap Shawl - Pink with Coffee Only $4.99! You are here: Home / Great Deals / Amazon Deals / Soft Wrap Shawl – Pink with Coffee Only $4.99! Soft Wrap Shawl – Pink with Coffee Only $4.99! This is such a pretty color! A great accessory to throw on in the evening to keep the beach air chill off you or to perk up your outfit! 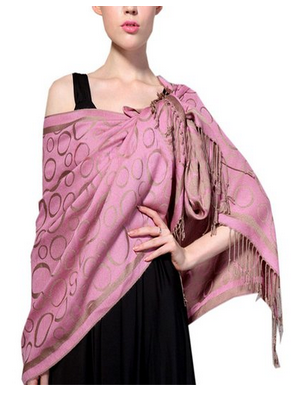 Wear this Soft Wrap Shawl – Pink with Coffee Only $4.99 when you want to stand out from the crowd! Get FREE shipping on orders > $35!